I got a complimentary copy of this one from the author in exchange for an honest review – thank you very much! The reviewer said (in her head, of course, and not expecting any answer): is there no more verbs in English, apart from “say”, which might be used in dialogues? To the list of sins committed by the author I might also add: over – explaining and gratuitous repetitions, sometimes even in the same sentence (“The Balbach family‘s history of tragedy spawned a peculiar, though understandable, sense of collective Post-traumatic stress disorder, or PTSD, on the part of Andy‘s family”) infodumps (Like the whole Andy Balbach’s family history – too long to quote it here but believe me, rather long and boring to go through), and typos that, inadvertently I presume, rendered the text rather cryptic (“Ten-Cubed did that to you. It scammed your life, sucked your soul, and stole what little god you had left. (…)However, there was more than no more god.” Hmmm…what god again and where it came from? More than no more?). Mind you I quote here sentences from the first chapters of the novel which are usually reviewed and edited more times than the middle part or the ending. I dumped the book after 30 pages of torture – I don’t think I deserved even that much. Everybody can write and publish nowadays but not everybody should. Apart from that, employing a professional editor and/or a proofreader really makes sense. 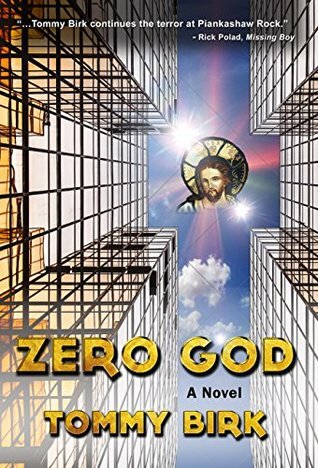 This entry was posted in book review, contemporary, suspence, thriller and tagged a total failure, bad narration, tommy birk, typos, zero god, zero good. Bookmark the permalink. It is so easy to fall into the “say” category especially if the author doesn’t re-read the work. Putting dialog tags in front of the quote is just awkward and weird. Awkward and weird it was. Plus extremely shoddy. Ouch. It hurts to even read the review. But I shouldn’t have expected much after seeing the cover: usually, they say “don’t judge the book by the cover” but in a way, in self-publishing, it usually makes sense: a bad cover more often than not means that the author didn’t give much attention to the publishing process as a whole. Yeah, that rule is sound. There are some exceptions but rather few and far between.